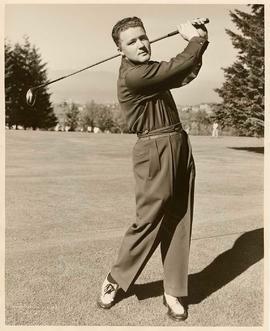 Photograph depicts golfer Kenneth Black, post-swing. Black was inducted into the Canadian Golf Hall of Fame in 1987.Man in centre of image holding golf club (driver); golf course and golfers in background. 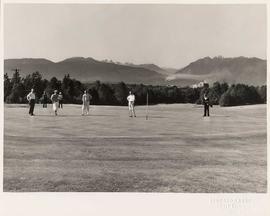 Photograph depicts a golf green at Quilchena Golf Course.Tee flag in middle of green in centre of image; trees and residential area in background.